Luton Town have a 'number of weaknesses' according to Fleetwood Town boss Joey Barton ahead of the Cod Army's trip to Kenilworth Road tomorrow. The Hatters go into the game possessing the joint best home record in terms of wins out of the top four divisions, with their eight successes matched only by Premier League champions Manchester City. However, Barton, who has seen his side take 11 points from a possible 30 on the road this season, including big wins at Scunthorpe United (5-0) and Doncaster (4-0) believes there should be no fear going into the game. 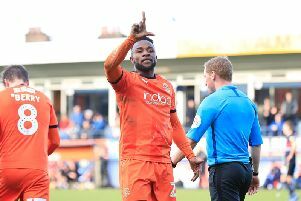 He told the club's official website: "We know the task ahead of us, everyone knows how well Luton are doing at home. "But also the reality of it is we do have a squad capable of going there and upsetting the form book. "I watched the game against Bury on Sunday and they do not fill me with fear. "It is not like we are going to the Etihad to play Man City.